Amateur baking challenge. The remaining bakers must bake without sugar, gluten or dairy - but thankfully not all in the same challenge. 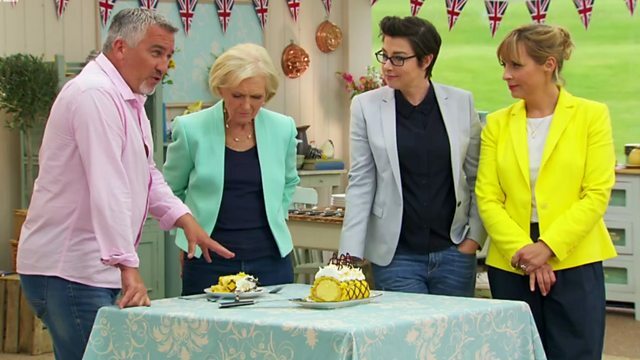 The remaining bakers must bake without sugar, gluten or dairy - but thankfully not all in the same challenge. First up, the signature challenge sees the bakers create a variety of sugar-free cakes, from an upside-down pineapple cake to carrot cakes. They use honey, agave syrup and fruit, but there's more to replacing sugar than just adding sweetness. For one baker, going sugar-free isn't enough as they take the healthy option one step further and bake a cake without any traditional forms of flour. Paul picks the technical challenge, gluten-free pittas, which are made with a very sticky dough that tests the bakers' skill - but which of them can get the desired pocket within their pittas? For their show-stopper, the bakers must make dairy-free ice cream rolls. Mary and Paul are looking for silky-smooth ice cream, surrounded by jam and a light sponge. Coconut milk provides the base for all the ice cream, tropical flavours are in abundance, and there's more than one desert island for the judges to try - and even a fondant sunbather. Find Paul's pitta bread and the bakers showstopper recipes on the BBC Food website. iWonder explores how to hit that sweet spot, sugar free. To blind bake or not to blind bake? "Can you knead a liquid?"